The War on Cash is on! If you are used to making visits to your bank to make your credit card payments, you may find this no longer an option in the future. Some banks are no longer accepting (or limiting their acceptance) of cash deposits. 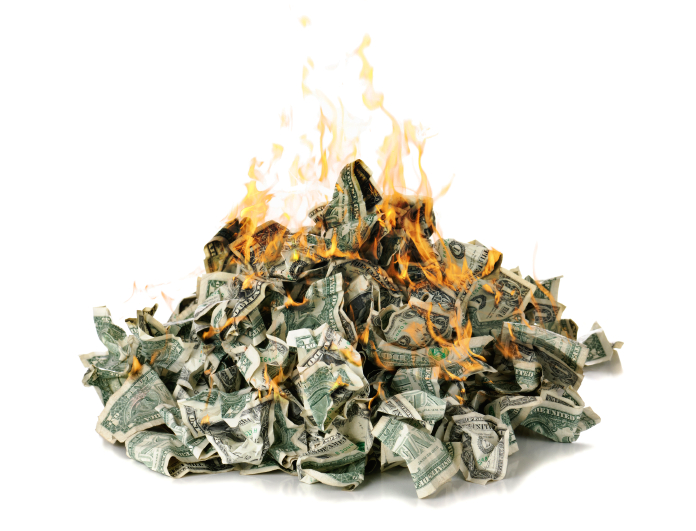 The war on cash forges on. Paper money, which is indeed more or less worthless, is slowly being taken out of circulation and being replaced by digital currency. Photo credit: Stephen Krow This shift presents of course the same fundamental problem as paper money itself: “digital money” is also not backed by gold or other precious metals or any asset representing real value. The whole concept of digitizing our transactions is being marketed as a convenience, a hassle-free payment method and a transparent, easy new way to smoothly run our lives and businesses, without the burden of carrying cash around. However, the realistic flip side of this joyful argument is more ominous than we might at first realize: Now, account monitoring or freezing, and confiscations will be easier than ever. And of course, by eliminating cash, central banks are getting rid of the last existing barrier to negative interest rates. The Global Economy is Stuck… Gold is on a Roll In the first quarter of 2016, the gold price rallied by 14.3%, and in February alone, it jumped 9.6% – this was the highest single-month increase in four years. In the first quarter of 2016, the gold price rallied by 14.3%, and in February alone, it jumped 9.6% – this was the highest single-month increase in four years. 2016 has so far not shown any positive changes on the economic front. Growth remains rather slow, much slower than projected by government authorities and the various mainstream market experts and gurus. So what has driven the demand for the precious metal? It goes back to the basics: Risk! 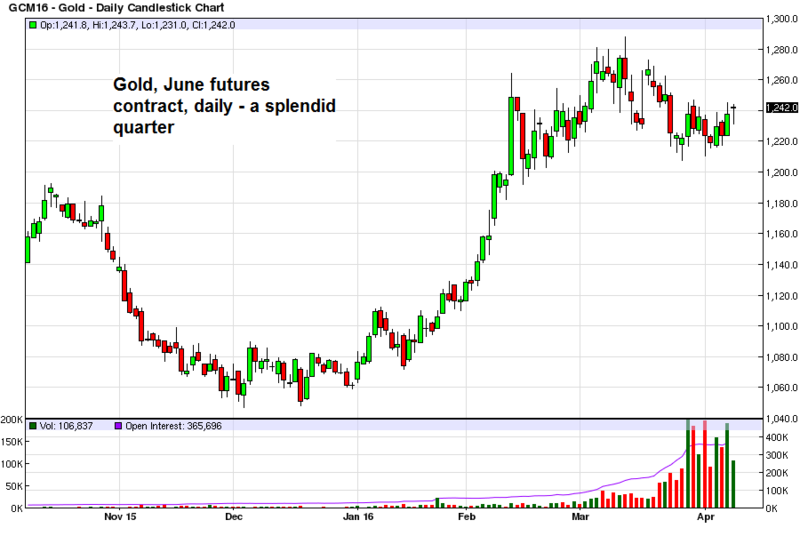 Gold, June 2016 futures, daily – click to enlarge. It is abundantly clear that investors, whether individuals or institutions, are hedging against the volatility in equity markets and the existing (and rising) economic uncertainty, stirred by recent central bank decisions. In its last committee meeting, the Federal Reserve decided to maintain its target rate for the federal funds rate at 0.25% to 0.5%, but changed its outlook, stating that it will hike rates twice and not four times within the coming year (as was previously announced). If there aren’t any unexpected surprises, we doubt there will even be two rate hikes this year. Meanwhile, the European Central Bank moved deeper into negative territory, dragging the deposit rate down to the ultra-low level of minus 0.4 percent. ECB President Mario Draghi also announced larger bond purchases of EUR 80 billion per month (up from EUR 60 billion previously). And while Draghi said that he cannot take rates further down, who is to say that this is final? In the case of the Fed, many had expected another rate hike this time around, putting their trust in the Fed’s previous announcement that it will likely raise rates four times in 2016. Instead, the Fed surprised markets by maintaining current rate levels and announcing that potential rate increases will be limited to (possibly) two only. To top it all off, Fed Chair Janet Yellen stoked the fire further with her remarks regarding the European approach to negative rates: ”We wouldn’t take those off the table”, she commented, when asked by Republican Senator Bob Corker whether the monetary policy-making Federal Open Market Committee would consider implementing negative interest rates. Central bank deposit rates in Europe – click to enlarge. This example clearly demonstrates that no announcement can be taken at face value. In fact, even though the Fed seemed determined to pursue a reversal of its Quantitative Easing program, at the moment this seems increasingly unlikely. The current monetary policy belief, the naive notion that simply printing more and more money can fix the fundamental and structural problems of our economy, is so deeply entrenched in the minds of policy makers, advisors and politicians alike, that it is unlikely to change in the foreseeable future. According to Steen Jakobsen, the Federal Reserve is reaffirming its policy objective to maintain a weak dollar; the Fed cannot afford to let the dollar appreciate. “A weaker US dollar is the only policy tool which can help stabilize the world economy”, he says. However, we fail to see how this is possible in an economy so fatally overwhelmed with debt and paralyzed by low growth rates. New waves of interventionism, quick fixes and temporary band-aid solutions seem improbable cures for a global economy that has repeatedly proven to be simply unresponsive to such “treatments”. What has Driven the Gold Price in Recent Weeks? Though it is not our objective to forecast the gold price, we are interested in discussing the underlying forces that bolstered consumer demand for the precious metal, which can be traced back to two main factors. First, an important role was played by higher demand by consumers and central banks in emerging markets, particularly China, which were to a great extent prompted by their depreciating local currencies versus the U.S. Dollar. Secondly, the recent uptrend in gold price is also underpinned by lower gold supply, as it dropped by 4% in 2015 to its lowest level since 2009, mainly as a result of lower mining production and recycling reaching multi-year lows in the fourth quarter. Additionally, more central banks are pulling out of the bullion trade, preferring to either maintain their current gold holdings or increase them. Top gold buyers were Russia, China (began regular reporting of gold purchases in July 2015) and Kazakhstan. The yuan vs. the dollar – the possibility of a further yuan devaluation has spooked the markets – click to enlarge. As we explained in our last Outlook, the slowdown of the Chinese economy and the domino effect it may have on global markets is a major concern. On the one hand, there is the risk of a devaluation of the Chinese Yuan that would greatly affect international trade, and on the other hand, China exporting its deflation. These were the fears that led central bankers worldwide to once again pursue what they perceived as the less painful path, albeit only temporarily, by maintaining zero and negative interest rates – the latest Fed and ECB decisions confirm that. Central banks are once again turning to their two favorite market “fixing” tools: introducing fresh stimulus and forcing interest rates lower. Particularly in tandem, these only serve to postpone, to prolong and to perpetuate the malady of our economy. Although central banks hope to encourage slow economic growth and inflation, the solutions they are resorting to are not addressing the root causes of the problem, neither do they offer a realistic plan to boost production and generate real output. The EU presents a fine example of the real-life implications of misdirected spending policies: consider the latest wave of government spending focused on housing for the incoming wave of migrants into the continent, a decision sold on humanitarian grounds, but also as a way to stimulate the sputtering economic recovery. It might indeed be half true, in that it would address the humanitarian and social problem of migrant housing (in the short term), but under no circumstances can it bring any real economic benefits for the region. The policy is not directed towards investments aimed at lifting overall production levels, it provides no long-term structural economic incentives and just like all the stimulus packages that came before it and will undoubtedly come after it, it only employs wishful thinking to postpone the inevitable. In the very same vein, common sense begs the question: how could pushing interest rates into negative territory ever help speed up growth rates? It is no wonder that people are losing faith in central bankers and the financial system as a whole. Who wants to entrust their life savings to a system that is on a mission to strip them of any real value? The only beneficiaries from negative interest rates are debt-ridden governments adopting desperate measures in desperate times (Japan is the world’s most indebted nation with a 246% debt to GDP ratio), as well as big institutional and private debtors. Another interesting and more specific example that justifies this “crisis of faith” in government was presented by Prof. Thorsten Polleit, who argues there is another, covert reason behind the Fed’s decision: student loans. In the U.S., federal loans to students have grown by a staggering 818% since the global financial crisis, and this number does not even include private loans to students. A quick look at a recent report from the Bureau of the Fiscal Service, a division of the U.S. Treasury, reveals that out of USD 3.2 trillion in government assets, comprised mostly of net loans receivable (USD 1.2 trillion), the Federal Direct Student Loan Program accounted for USD 880.6 billion (72.4 percent) of total net loans receivable. Bearing in mind the old “cui bono” credibility test, perhaps it becomes increasingly clear that the Fed stands to gain from the growing debt bubble of its own making. It also becomes clear that the political implications of this strategy, as well the severe social consequences of financially subjugating the younger generation and saddling it with debt for life, strongly stress the need for our governments to reevaluate their priorities and duties to their people. Lessons from the Past – Where do we Stand Today? The last gold bull run took place between 1999-2011, from a 1999 low of USD 252.8 to a record high of USD 1,895 seen in September 2011. The price rally back then was driven by strong emerging market growth supporting consumer demand, and was characterized by a flight to quality and later a need for security, reinforced by the global financial crisis and the debt bubble. 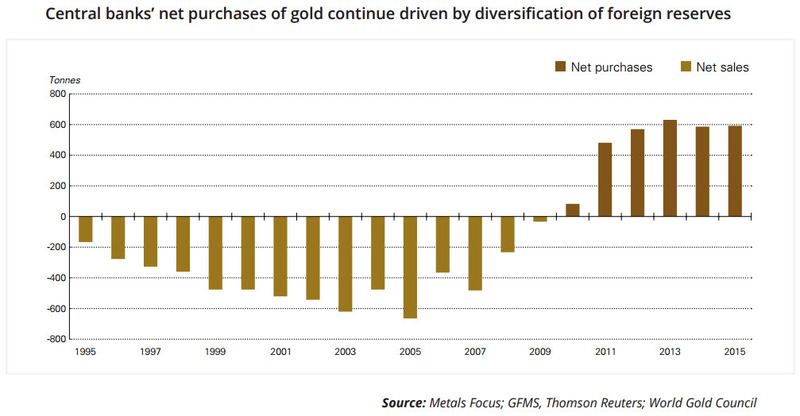 Central banks purchases after the global financial crisis also certainly helped boost the gold price during that phase. Driven by their objective to diversify foreign reserves, central banks purchased 588.4 metric tons in 2015 – which represented 14% of total bullion demand, according to the World Gold Council. Central bank gold sales and purchases, net – click to enlarge. Naturally there is, as one would instinctively expect, a very clear historical correlation between the demand for gold and times of uncertainty, demonstrated in both long term and short term cases. We have recently witnessed the latter, as short-lived, both upward and downward, tendencies followed Fed announcements and Mario Draghi’s remarks, either causing investors to seek safe haven in the real value of precious metals, or in previous months, promising growth and discounting the need for gold. Such fluctuations reflect the importance of human psychology in the economy, but have little informative or predictive value when it comes to the bigger picture. Panic-ridden investments, knee jerk reactions to breaking news and a few hours or days worth of trading session data cannot suffice to predict long term shifts or forecast the future of gold. 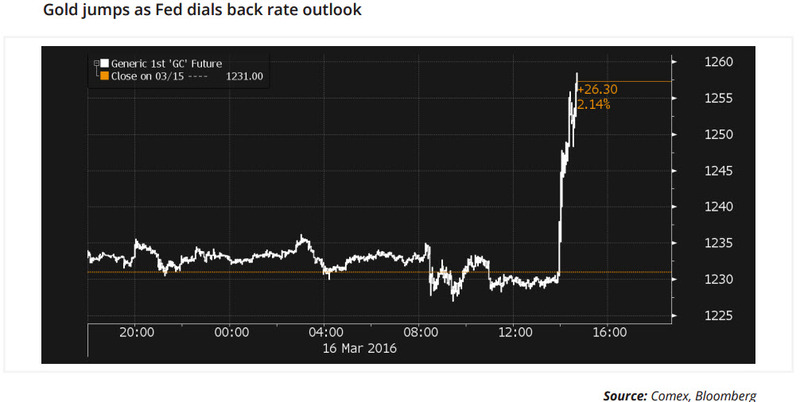 The gold price jumps in mid March following the release of the FOMC statement – click to enlarge. We want to take this opportunity to discuss two key determinants that have historically correlated with the gold price: interest rates and the U.S. Dollar. When does demand for gold pick up? When interest rates fall, which makes yield-earning financial instruments less attractive. This inverse relationship can be seen in the chart below. 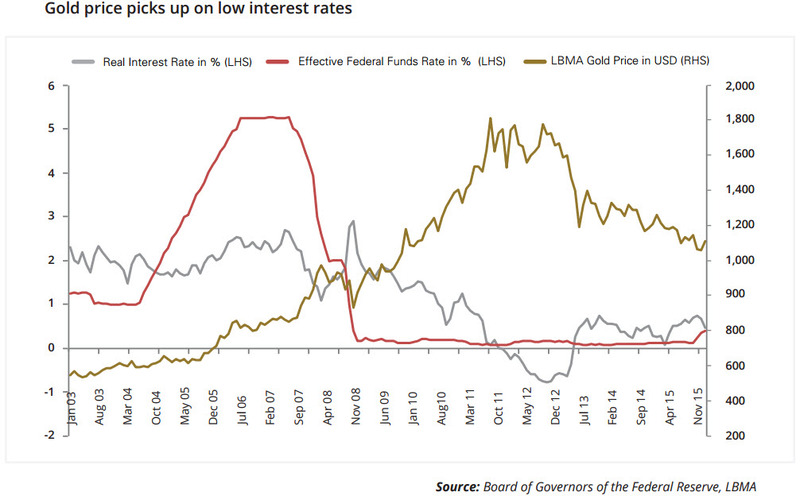 At times when the Fed sought to raise rates to redress inflation, it caused a drop in the gold price, and vice versa. This can be mainly attributed to the positive and significant advantage of gold, that it lacks a counter-party and default risk. Additionally, its function as a store of wealth acts a strong hedge against inflation risks. In view of this, keeping the negative interest rate scenario “on the table” can be seen as boon for gold. When looking at real interest rates, historically gold has tended to perform well when real interest rates have been below 3%. We therefore conclude that if negative interest rates indeed remain on the table, this could support the next “leg up” for the gold price. 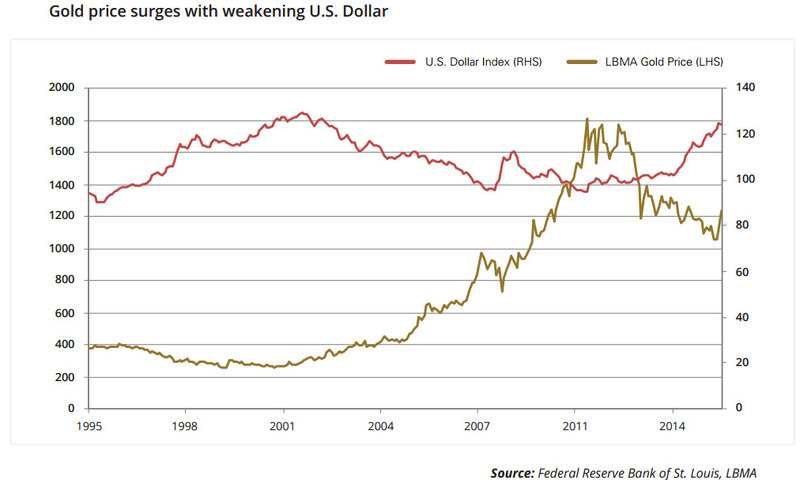 Gold benefits from declining interest rates – click to enlarge. Despite the precious metal being in a bear market over the past few years, during which we witnessed several steep drops in the gold price, we maintain our positive stance as the fundamental arguments remain intact and reinforce the globally growing demand for gold. The public is slowly but surely losing faith in the system and becoming increasingly skeptical towards central bank and government policies, projections and promises. An economic environment with artificial negative interest rates combined with a cash ban ensures that wealth can be extracted while concurrently imposing control and scrutiny of everyday transactions, thereby ultimately violating all notions of private property and personal freedom. There is no doubt that the next crisis will be self-inflicted by those managing the current system. Step by step, these measures will further increase the public’s demand for precious metals. “Central banks aren’t interested in what works, they’re interested in their own prestige. And they are so deep into it already and it didn’t work. They will increase the medicine,” said renowned financier Marc Faber, the publisher of The Gloom, Boom & Doom Report. “Eventually, they’ll buy all government bonds; they’ll buy all corporate bonds, all outstanding shares. Thereafter, if the housing market goes down, they’ll buy all homes and then the government will own everything,” he added. This policy is clear in the chart below – through its Quantitative Easing policy over the past nine years, the Fed has mushroomed its assets from less than USD 1 trillion in 2007 to more than USD 4 trillion. The market is waiting for the next rate hike that was promised but still remains in limbo. 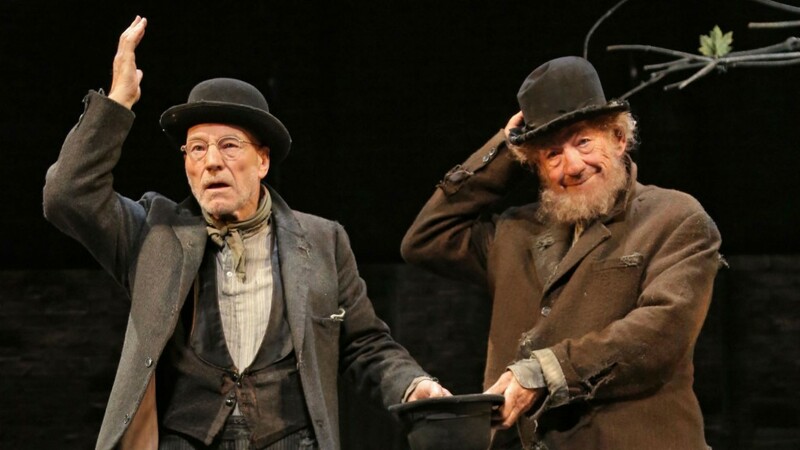 Prof. Thorsten Polleit made an interesting analogy, comparing this “waiting game” to Samuel Beckett’s play “Waiting for Godot”, in which the two leading characters spend the entirety of the play waiting for the arrival of a person named Godot. Although he never appears, they continue to hold on to the hope that he will eventually show up. Just like Beckett’s characters, the public is continuously promised a rate hike, which does not seem likely to arrive. The longer the Fed’s rate hikes are delayed, the less likely it becomes that they will actually happen. QE may well be set into motion again; a rate cut cannot be ruled out, particularly if the U.S. economic situation deteriorates once more. Rate hikes would no longer be considered an option. However, the time will come when the policy of piling on yet more stimulus programs will simply fail to convince the audience that these are viable solutions. It is actually likely that we are already past that point and that the public’s trust in the “medicine” is so dramatically diminished that it wouldn’t even work as a placebo. 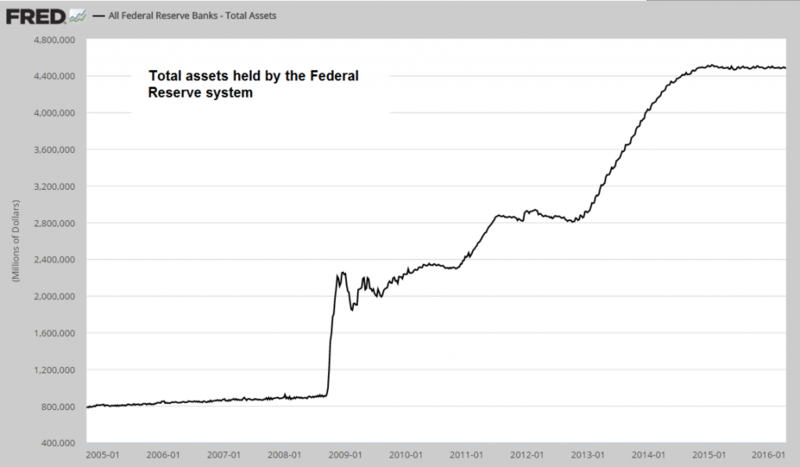 Total assets held by the Federal Reserve – click to enlarge. Definitely not! One must not forget that the value of money can diminish over time. Based on the law of diminishing marginal utility, the benefits provided by a good decreases with every additional unit of that good. The same applies to money. The benefit and satisfaction we get from money drops with every additional unit the central banks print. In the current economic environment, in which the value of money is systematically diluted, it is wise to allocate a portion of one’s assets to precious metals. This does not only apply to individuals, but enterprises as well. Negative rates do not facilitate anything in the real economy, they merely burden companies with additional fees and penalties. 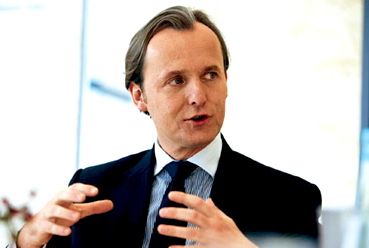 Munich Re, the world’s largest reinsurance company, is vaulting gold and even cash and shunning banks, so as to avoid the ECB’s current negative interest rates, which would penalize the company with -0.4% for depositing cash. If more companies follow suit, this could easily snowball into widespread cash hoarding: The ECB will surely not stand for that – the final big leap to eliminate cash may come sooner than we think. 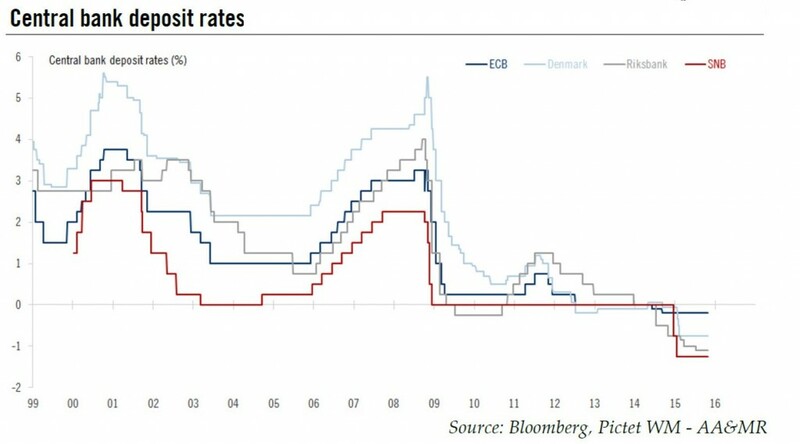 Negative interest rates are not going away anytime soon, even though central banks surely must recognize that QE has no impact on the real economy. It only goes into financial assets, blowing their prices up artificially. With negative interest rates, the debtors benefit and savers pay. That is how the game has now been rigged: financial institutions are set to gain at the expense of everyone else. Over coming years, as this becomes more and more apparent, the only responsible and reliable option for prudent savers seems to be financial insulation: storing physical gold and silver outside the banking system, where their savings can’t be printed away, resp. suffer the same catastrophic fate as deposits, cash, or any other form of wealth and property that is open to the system’s arbitrary manipulation and invasive control. Historically, we can trace how gold and silver have successfully served as the foundation for strong, stable and prosperous economies. Ever since central banks have shifted their policies and detached them from any anchor to real value, the global economy has grown weaker and more fragile, and circulating currencies are becoming increasingly worthless. Unlike the West, culture in the Eastern cultures believe in the value of gold as the “perfect money” that secures wealth, as evidenced by their growing demand for the metal, whether by individuals or institutions. Certainly, a massive shift back to monetary sanity and to policies grounded in reality could spell the end of this downward spiral, but given the mindset, the interests and the politics of the economic arena, this is highly unlikely to happen in the near future. But even under current circumstances, one can still personally take responsibility for the fate of ones own financial position, business and investments. One still has the option to take precautions, to protect one’s assets and to “keep a safe distance” from the government’s reckless and irresponsible experiments with the economy, by relying on the real value of precious metals instead of on the recurrent promises and grandiose plans of the powers that be. We need to change the mindset of our culture, which has been brainwashed into thinking there is no such thing as “perfect money”. History, society and markets have tested gold and the verdict is clear and resounding: Gold has stood the test of time, as the only reliable option to protect, preserve and secure wealth.